It’s no secret that I don’t like Wal-Mart. In fact, I pretty much abhor it. I abhor it not for its merchandise or its low prices, but principally because they give their workers the shaft. They push workers to crazy and dangerous levels of productivity, constantly look for ways to work them even harder, give almost nothing in the way of benefits or job security, and don’t begin to pay them enough to actually live on. On a Black Friday a few years back, bargain-crazy customers crushed a Wal-Mart worker to death. Most of their employees are not full time employees, but part time workers. This is not unusual in the retail business, of course and it is fine as far as Wal-Mart is concerned. Part time employees cost less, are easily let go, can have hours cut on a dime and get no benefits like vacation pay. Granted that full time employees at Wal-Mart don’t make much either but they are entitled to some measly benefits such as overtime pay, if Wal-Mart will actually grants them, as they have been loathe to do in recent years. The fact is that even full time Wal-Mart retail employees, with a few exceptions, cannot survive on Wal-Mart wages alone. This is true even if they have additional jobs. Most of them qualify as working poor. They can be found trying to make up the difference shuffling two or three jobs, hoping for handouts at food banks and when needed getting treatment at emergency rooms. In most states, children of Wal-Mart employees make up the largest group receiving health care via the Children’s Health Insurance Program (CHIP). For example, in Alabama alone Wal-Mart employees have 4,700 children enrolled in the CHIP program, more than twice as many children as employees working at McDonalds in Alabama. Wal-Mart won’t raise salaries of their employees so they can afford health insurance, so taxpayers are left to pick up the tab. Since Wal-Mart does not have to pay for their employee’s health insurance, and the few that are eligible for Wal-Mart’s very limited health insurance plan are able to afford it, this in part explains how they deliver low prices. In effect, taxpayers subsidize Wal-Mart’s low prices. Taxpayers are making up some of the difference between the real cost of living and wages that Wal-Mart is willing to pay. It is still not enough. Despite working forty or more hours a week, many Wal-Mart employees also qualify for food stamps. This strikes me as obscene: how can it be possible to be fully employed in this country and still not have enough to eat? How can we possibly permit a minimum wage that won’t even keep a person from going hungry? In some ways though the workers in the stores have it good, at least compared to Wal-Mart’s warehouse workers. Wal-Mart will say that they are not their workers, so they don’t count, but the people who fill trucks at distribution centers mostly are loading trucks full of goods that are shipped to Wal-Marts. They are working in hellish and unsafe working environments. They too are often subjected to unpaid overtime, numerous violations of safety and overtime regulations as well as long and crazy hours. Low prices of course are also made possible by squeezing the whole Wal-Mart supplier chain. When you keep squeezing distributors and suppliers, they keep finding ways to squeeze workers. The results are pretty obvious and accounts for much of the minimal wage growth over the last decade. Still, when you make as much in the way of profits as Wal-Mart does (about $15B a year), it’s clear that the company could afford to do a lot better for their employees, but simply won’t. Wal-Mart is emblematic of a general trend that stockholders win at the expense of workers. In the case of Wal-Mart, it is also at the expense of taxpayers. Arguably, Wal-Mart is a prime example of corporate welfare at work, which likely explains the company’s outsized contributions toward political candidates. However much they spend to influence politicians, it must be considerably cheaper than paying their employees a living wage. It’s been ten years since I stepped inside a Wal-Mart. It’s possible I never will step inside a Wal-Mart again. My condition for shopping at a Wal-Mart again is that they have to pay their employees a living wage. Right now Wal-Mart simply refuses to do so, even for the full time ones, unless they are a store manager and maybe if they run a department. If an employee does earn a living wage, if you divide their wage by the number of hours these workers actually work, their wage per hour is still low. Many of them are salaried, which means you may be working sixty or more hours a week but being paid for forty. Obviously Wal-Mart is not the only retailer screwing its employees. The same can be said for most of the major retailers out there, including Target and Kmart. However, there are prominent exceptions. Costco is one of the most successful retailers out there and is also quite profitable. Applicants are beating down its doors to get jobs there. That’s because Costco pays living wages and Wal-Mart does not. The grocery chain Wegmans also pays living wages. It’s obvious when you are in a Wegmans that its employees like their jobs. They almost gush with enthusiasm and energy. You can’t say the same for Wal-Mart greeters. Recently, some Wal-Mart workers have realized they simply have nothing left to lose. There have been recent walkouts that resemble strikes at twelve Wal-Marts across the country. You can’t really call them strikes because Wal-Mart is famous for being non-unionized, at least here in the United States. Wal-Mart workers have made slight inroads elsewhere, like in Canada and ironically Communist China (although its unions are really puppets of the Communist Party.) Strikes are not problems at Costco and Wegmans, probably because management treats employees with respect and compensates them fairly. They happen when the frustration level becomes so acute that workers simply cannot endure it anymore. These Wal-Mart walkouts may be a harbinger of things to come. I do know one thing: if the behemoth Wal-Mart can be made to scream uncle, then justice is possible for retail workers across the country. 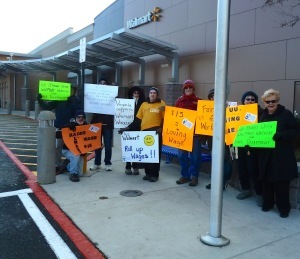 That it is starting to be felt at Wal-Mart through strikes and walkouts is poetic justice. If employees can be paid fair wages at Wal-Mart, it could create real change across the entire retail industry, whose employees desperately need to be paid living wages. So I wish these strikers well, and hope that more Wal-Mart employees join them. I am glad to make a contribution to their strike fund and urge them to hang tough. For like many of us, I too was once an underpaid retail worker. More than thirty years has passed but I have not forgotten how shabbily I was treated. So far I have been able to do little more than avoid patronizing the more egregious employee-screwing retail chains like Wal-Mart. As I get older and find myself with more money in my pocket and time to become engaged in just causes, the more I feel the need to work for their justice and wreak some real justice on amoral corporations like Wal-Mart. Sometimes a news story epitomizes what is wrong with our society. Sometimes they come in double doses. Two stories in the news have drawn my attention and ire. Both need more press than they have gotten. In today’s post, I concentrate on the first outrage. Black Friday this year turned black for an unexpected reason. No, it was not black because of the crappy economy. This Black Friday crazed shoppers at Wal-Mart’s Valley Stream store on Long Island trampled a store employee to death. A huge crowd estimated at two thousand pushed down the store’s doors at its early 5 a.m. opening time, trampling to death Jdimytai Damour, a Wal-Mart employee who had started only a week earlier. According to news reports, the door was crushed like an accordion by the weight of the crowd. Shoppers intent on snatching bargains poured through its doors, giving no thought to the man they were trampling and asphyxiating in the process. At least four others were injured in the melee, including one pregnant woman. Damour’s family is likely to sue, but I bet that within Damour’s employment contract is a provision exempting Wal-Mart from lawsuits like these. Morons obviously are not managing Wal-Mart, just heartless bastards that see retail workers as interchangeable and expendable. So Wal-Mart likely has their lawyers make sure their liability is limited even in these sorts of situations. Last that I heard, Wal-Mart was not a proactive enough company to do obvious things like put up a rope line in front of the store. Nor apparently is building reinforced doors important since that would mean, like, spending more money. However, the company is proactive enough to purchase life insurance for their employees. This life insurance though does not go to the family of deceased employees in their care, but into Wal-Mart’s coffers instead. Pretty much everyone associated with this death should feel ashamed. Every shopper who rushed into the store, even if they did not actually trample on Damour’s body, should feel ashamed for contributing to the situation. How could they put the lust for stuff ahead of a human life? I doubt though that anyone is feeling any shame. Chalk up one death of another interchangeable retail worker to the cost of doing business in the 21st century. The important thing is that Wal-Mart remains profitable! People with consciences, like me, figure the store manager should resign, both for not protecting this employee adequately and for not taking all steps to ensure that the crowds were controlled. Yet, the store manager reopened the store just a few hours after Damour’s death. I guess when you work for an amoral company, you are hired in part because you are amoral. Even if the store manager wanted to keep the store closed, the corporate office was probably on the phone demanding that the store reopen immediately! Wal-Mart has pricey enough lawyers so that they will probably successfully dodge any financial judgment against them. They probably feel they suffered enough by closing the store for a couple hours on Black Friday of all days. Much more likely, Wal-Mart simply doesn’t care. The trampling to death of an employee, however regrettable, is the price someone else must pay to make sure they have “Low Prices, Always”. Consumers seem unmoved by this incident too. Nearly alone among major retailers, Wal-Mart is showing an increase in sales this holiday season. Back in 2003, I wrote this post on the reasons why I will not shop at Wal-Mart. I disparaged not just the company for its contemptuous attitudes towards its employees, but also its customers. At the time, the post drew some heat (several nasty comments were removed) but it appears, if anything, that I did not hold its management or its customers in low enough esteem. Back in 2003, I said I would never shop in a Wal-Mart again until they treated their employees right. It looks like that date, which seemed far off even back then, has receded even further. If there were a big box retail workers union (and god forbid Wal-Mart permit anything like that) the union should fund a national shrine to memorialize Jdimytai Damour and all the other vastly underpaid human beings who make American retail commerce possible. Damour is likely not the first martyr for the cause, but his death should be memorialized anyhow. If I had the power, I would require the monument to be in placed right in front of the main entrance. It would have huge lights shining on it. Damour’s name and date of death would be prominently inscribed with the words, “Damour died so that you could have Low Prices, Always”. Instead, this tragic and preventable death is likely to be just a footnote. In a year or two, only a few of us cranks will even remember it at all. Meanwhile, the amoral Wal-Mart Corporation will of course be laughing all the way to the bank, its stockholders will be delighted in their weighty dividends and its customers will be thrilled at those low, low prices. I am very grateful that I did not make retail a career. It is a scummy business, operating on very low margins and subject to the constantly changing whims of consumer demand. If you do decide to make retail a career then with a few exceptions expect to be treated shabbily. We need no further proof of this than recent press reports that the electronics retailer Circuit City is firing its retail salespeople because it apparently thinks they are overpaid. Steven Rash, 24, said he was one of 11 workers fired at a Circuit City in Asheville, N.C. The store manager broke the news during a meeting at 8:15 a.m. and escorted them out of the store. Rash said he has worked for the retailer for seven years and was one of the most junior members of the affected group. He said he earned $11.59 an hour and worked from 15 to 20 hours a week. He received four weeks of severance pay. Though he has a full-time job at Bank of America, he said he needs to find part-time work to help pay his student loans. Like most people working retail, Steven Rash is working part time. Retailers, like many small employers, prefer part time workers for the obvious reasons: they do not have to pay them benefits, they are readily expendable and can typically be easily replaced, because their job is not highly skilled. My wife does not work retail but is one of the part-time work force who falls into this category. In her case, she works as a level-one computer troubleshooter for a doctor’s practice with a staff of about 50. I will not say how much she earns, but I can say when she was working full time she made about $10 more an hour than she makes in her current position, and she was then surviving on a school teacher’s pay. Now she keeps the computers working at two offices in this practice for very modest wages and typically works 20-30 hours a week. It is a good thing that she has my financial wherewithal to rely on. If we were divorced, she would be in serious financial straits. Even if she could convert her job into a full time position, could she even afford to keep a roof over her head? (We live in the metropolitan DC area, and rents start at $1200 a month.) I doubt she could afford to live alone. Despite working in a doctor’s office, she would have minimal benefits. The practice she works for is feeling squeezed too, perhaps because Medicare is squeezing them with reimbursement rates that do not cover their expenses. It trickles down to substandard wages and high employee turnover. She says in a typical month about 10 people on the 50 person staff leaves for better offers. The same is true in the retail business too. At the wages they are paid, there is little incentive to stick around. There is even less incentive to feel any loyalty for your employer. Mr. Rash depends on $11.59 an hour to pay off his student loans. He was probably drawn to Circuit City, not because it paid well, but because it paid better than other scummy retailers like Wal-Mart. Still, $11.59 an hour is hardly the sort of salary that would let you lead an opulent lifestyle. By my calculations, if he could have converted his sales job to a full time job he would make $24,000 a year. For him his “expensive” $11.59 an hour salary is now moot. The severance pay will pay for a month of student loans. He can take some comfort in that. Many retailers would not even provide a severance check. Nevertheless, likely his next second job will pay even less. Circuit City is helping to lower the bar and to ensure even more Americans cannot earn a living wage. Way to go, Circuit City. Mr. Rash is also fortunate in one other respect: he has a full time job. It is likely that Bank of America offers him some benefits. I do not know how typical he is of most Circuit City workers. Clearly though not all retail workers are part time workers nor depend on the income just to pay student loans. Many likely depend on these second, third or, in some cases, first jobs, to pay basic expenses. I hope for his sake that he works part time. Because if he has a full time job, then he is earning $8.65 an hour, which would be the wage the airlines are willing to pay to deter future terrorist attacks. I do not know if Denver International is one of these airports that are required to use federal screeners. At these wages, I suspect not. It is hard for me to believe that any federal employee would be required to do this sort of grinding work, day in and day out, on Wal-Mart wages. Not everyone in the retail business though is being screwed. As The Washington Post reports, Circuit City’s CEO is doing fine. While grunt salesmen and women suffer, his salary last year was $716,346. He also got $704,700 in bonuses, $3 million in stock awards and $340,000 in stock options. Imagine how much more he will get this year for this latest brilliant idea. The Washington Post also reports that the average hourly wage for retail worker, as of March 2005, was $11.14 an hour. Therefore, it is unlikely then that Steven Rash was underpaid. He was likely earning the market rate. This makes me wonder if this latest strategy by Circuit City will prove to be counterproductive. Call me dubious, but I do not think this strategy will help the Circuit City bottom line. Were I a Circuit City stockholder, I would be calling for CEO Philip J. Schoonover’s head or cashing in my stock. Where will this strategy take Circuit City, already suffering from competition from retailers like Wal-Mart and Best Buy? My bet is that it will probably take it right off a cliff. As a stockowner and thus an owner of the company, I would want a retail employee who is motivated to work in the best interest of the company, not some retail drone counting the minutes until closing time. I have empathy for retail workers because I was one of them myself. In the intervening 27 years, I have been only marginally successful in changing the retail worker market dynamics. I have joined the Wake Up Wal-Mart campaign, which has resulted in a few, modest successes. I have also supported politicians who advocate living wages with significant campaign contributions. I do know one thing: any company that improves its bottom line at the expense of its workers earns my disdain and contempt. Other retailers like Costco and Wegmans have figured out ways to pay living wages to their employees in highly competitive markets and have thrived. So can apparently scummy retailers like Wal-Mart and Circuit City. Their “leadership” is simply bereft of creative ideas. Although I have not shopped at a Circuit City in years, it now joins a growing list of retailers that include Wal-Mart that I will boycott until it treats its employees decently. They are not cattle. They are people. Employees deserve nothing less than to be paid a living wage and to be treated with respect.